The Philadelphia 76ers in the NBA aren’t the only ones trusting the process in the sporting world. 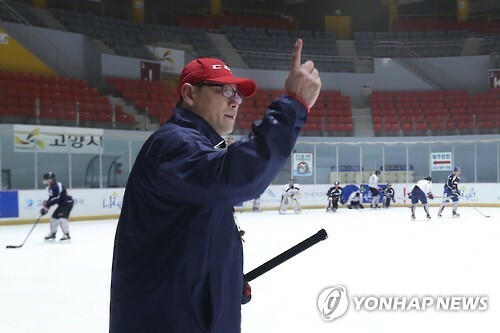 Just ask Jim Paek, former NHL defenseman now coaching the South Korean men’s national team. South Korea will make its Winter Olympics debut next year on home ice, with PyeongChang, some 180 kilometers east of Seoul in Gangwon Province, serving as the host. And Paek said the Asian Winter Games, to be held in Sapporo, Japan, from Feb. 19 to 26, will be a part of the team’s “process” to get ready for the Olympics. Asked what specifically he will look for in Sapporo, Paek said he will try to cover “every aspect of hockey,” from team play to mental game. The process has included fast-tracking Canadian and American-born players to South Korean citizenship. A handful of players have become naturalized in recent years, including No. 1 goalie Matt Dalton, with hopes of making the team competitive for PyeongChang and of pushing young homegrown players harder for the future beyond the 2018 Winter Games. However, Dalton, who got his Korean passport in March last year, may not be eligible for Sapporo under the rules by the Olympic Council of Asia (OCA) on naturalized athletes. Athletes must have lived in their adopted country for three years before they can represent that nation in OCA events. But the Korea Ice Hockey Association (KIHA) has asked the OCA if Dalton could still be eligible because he’s been playing in Korea since 2014. Paek, for his part, seemed resigned to the fact that Dalton, along with defenseman Eric Regan, will ultimately be ruled out of the Asian Winter Games. South Korea won bronze at the previous Asian Winter Games in Kazakhstan in 2011, behind the host nation and Japan. Those three countries should once again vie for medals in Sapporo. South Korea has never beaten Kazakhstan in 11 games, while it has managed just one win and one tie versus 19 losses all-time against Japan. Though Paek will most likely be short-handed without Dalton and Regan, the situation hasn’t sapped Paek’s optimism or confidence.